A new software has been developed by a few Danish engineers. The software is called OptumG2 and I have been able to download a trial version. OptumG2 is extraordinarily user-friendly and very fast. It gives very good results of the ultimate limit. I trust it is the worlds first finite element limit analysis software on the market which can also do settlements. 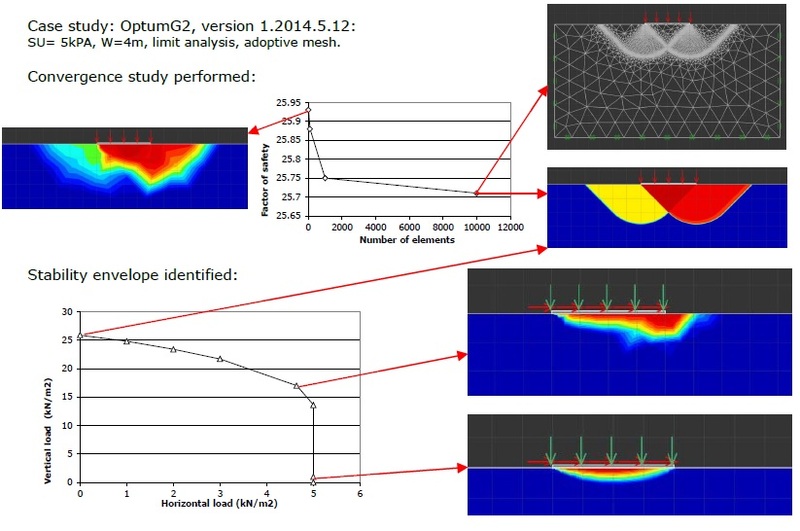 OptumG2 has several soil models including soft soil models so it can determine settlements of soft clay. Finite element limit analysis means it uses upper and lower bound to determine the ultimate capacity, which means you will be able to check the quality of your result by comparing how close the numbers are to each other. I decided to test the software and the work outlined below has all been done during my second session with the software, and less than 30 min. I have used an undrained model (nonporous) with an undrained shear strength of 5 kPa, foundation width is 4 m and I've use adaptive meshing. I think the adoptive mesh is really smart. 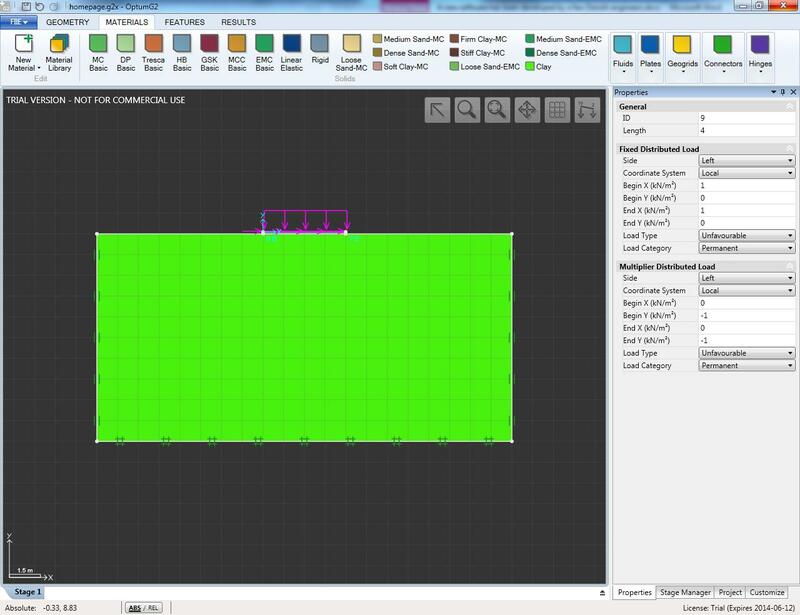 It saves time by the user and the software automatically identifies where it needs elements for an optimised model. Drawing the model has been made easy, especially with use of the function called relative position. Instead of global coordinates the software uses the relative distance from two points when drawing a line or a rectangle. The setup of the load control is quite smart. You click on the surface where the load is applied and you instantly have a panel where you can change the loads. That makes running several load combinations quite easy. Occasionally, you will run into an error message. I have not looked into this into much detail, but I think you need some routine to work out the origin of the problem in your model. I decided to do a convergence study to test the accuracy of the model but only for the upper limit. I ran models with 10 to 10,000 elements and even the model with 10,000 elements takes less than 30 seconds to run. The difference in the accuracy between 10 and 10,000 elements is approximately 1%. I've also identified the stability envelope of a VH loaded foundation. With the setup of the load control, this has been very easy. I believe it to be less than 10 min to identify the stability envelope. I used the video function and the software collapsed. I did a few times and on one occasion he worked. Below you will see a video of a sliding foundation. All in all, I'm very impressed with the software. It is very user-friendly, very fast and seems to give very accurate results. I have since the work above tested the other soil models and I am very impressed with the precision of the settlement predictions.